Social media sharing is one of the fastest ways to get your website indexed. Many businesses today use social media to a major online marketing strategy to reach potential customers and they end up expanding their business reach. And where do most people spend their time? Well, i spend most of my day either browsing through facebook, google plus or instagram, looking for something interesting, meeting new people or contributing. This is something most of us do this too. In this developing world we live in, having social media accounts for your business will enable you reaching a lot of people without even leaving the comfort of your home. With the right strategy, content marketing on social media sites tend to spread like wild fire. If you write quality and detailed content, followers would most likely like or share it with their friends. And because there are many social media sites out there, I have compiled the seven best social media platforms that would vastly increase the traffic and enable you rank better in search engines. 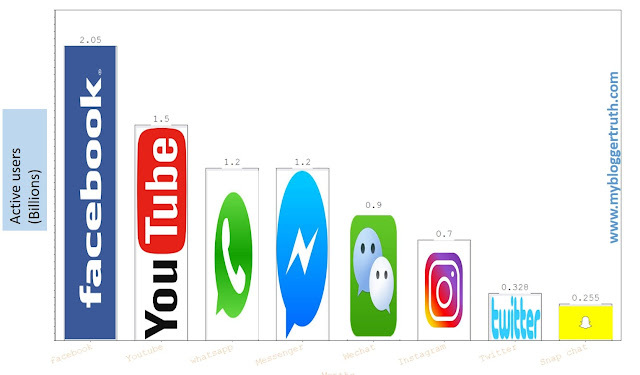 The chart of 2017 most popular social media platforms. Best social media platforms to increase traffic. The social media sites i will be mentioning have a huge amount of active users. Their importance cannot be over emphasized and can be used to your advantage. Facebook is hands down the most popular social media platform online. What i am trying to say is, who ever has access to the internet is most likely has a Facebook account. According to statistics, the amount of opt-in users increases by 19% year after year. Mark zuckerberg founded facebook in 2004, making it almost 13 years of its existence. During this time, they have been upgrading and updating earning the trust of users. That's not all, facebook average daily users is 1.32 billion. Yes! its very true, now image what that can do for your business. A tremendous growth in Facebook users, links closely to the world's development over the years. If your brand isn't tapping into Facebook potential traffic, you are definitely missing out on huge traffic generation. Go to your Facebook profile and create a Facebook page. Include a unique profile and cover photo of your brand. The display name and username should be that of your brand. Go to edit settings > page info - add website and description. Under edit page, You can edit the tab or option that appears on your page to what you want viewers to see. You decide to add tabs such review, events,offers and so on or a contact or message button linking back to your website. Under edit settings > page roles, you can add more users to help you mange the page to increase engagement. The added users can be given roles such as; editor, administrator, moderator, advertiser, or analyst. Invite friends and family to like your page. Link a group to your page. Not still getting enough likes? you can always use the promote option to run facebook campaigns to increase your reach to active targeted audience. This is one of my favorite social media platforms. It is popular and very much worth your time and energy. Here, people are allowed to join different communities they are interested in. It is an excellent place to get quality backlinks. Just in case you are wondering, no goolge plus is not dead. On the contrary, the number of active users rises year after year. Since it owned by google, you will find it among google apps. If you already have a gmail account, you can easily sign in to google plus with it. Start building your profile, to come across as a credible. Add a profile picture, tagline and an about page. Create a separate business page for your brand. Get active on google plus and connect with like-minded people. This social media network allows you to watch, upload or share videos and music to friends and family. From the chart, YouTube is said to have over 1.5 billion active users monthly. It is the second most popular social media site, after Facebook. It is also owned by google and the number one source of videos worldwide. You create useful content online, how about you transform them into videos. Many bloggers owe their success to YouTube generated traffic especially Neil Patel. Use keyword rich and appealing titles, include relevant tags your videos to gain more exposure. Embed your videos into your blog post as a further resource for readers. Share videos to your other social media channel to increase views. Twitter is also another very popular social media site with over 328 million active users. With just a hashtag, you can find and join the latest trends, news or events. They record a total of 600 million tweets everyday, not bad at all. It is a great avenue to build an audience for your business. Join twitter today, if you haven't already. Add other details to your profile, such as business photos, cover photos and you website link. Post a tweet at least 3 times a week with relevant hashtags. Be active, connect with popular people of your niche. Also follow their followers. With over 175 million monthly users and over 70 billion ideas. Pinterest is also good place to generate traffic. If you create quality images or infographics and are not tapping some traffic from pinterest, you are really missing out. Sign up > Add profile details > Verify website on pinterest. Link other social media accounts to pinterest, so when you pin new images it automatically shares to that account. Create vertical images to share to pinterest. Create boards with keywords common to your industry. This social media site is not been given enough credit. But one must know that it can generate a lot of traffic and leads. How? you may ask. By adding your page links, it is put into a StumbleUpon lineups. So when a user searches for content on a specific topics,that user stumbles on several pages. Add new pages to your likes. 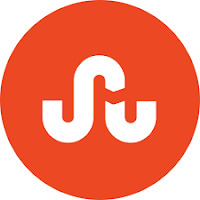 You can add a StumbleUpon badge on your website post. Search relevant keywords to find and follow people the have same interest as you. Another very useful social media platform with over 700 million active users. A good place to share pictures and an excellent place to drive traffic to your site. Just like twitter, you can add a click-able link to your website in your profile description. 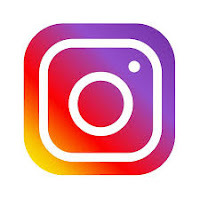 This will then be visible to any one that visits your instagram page. In my opinion, it is better to use your face as profile picture to represent your brand. Share clear and appealing pictures. Use hash tags (like on twitter) to reach a larger audience. IMPORTANT BONUS: Want to get more professional and gain even more traffic? Then sign up on LinkedIn as well. A social media site with filled with business oriented people. This may turn out to be your major source of traffic. After you have successfully created accounts on these social media site, start building an audience by been active. Also start sharing your content and increase your daily traffic. Be active: Socialise more, like other posts, comment on other peoples post, engage and so on. Have a strategy: The key here is to grow your social media audience and boost traffic. Draft out a plan on how you intend to do that. Use creative videos/images: start making your own images and videos that you can easily share on these social media sites. Use hashtags (#) when necessary. If you found this article helpful. Show some love, kindly comment or share this post. Thanks for this. Nice high level overview. Good post. There's so many reasons to use social media to promote your blog. Not sure about StumbleUpon though. How often do people really use it? I'd go for LinkedIn over it, if for nothing else than the chance to get connected with influencers in your field and potential clients. When it comes to traffic generation you have to tap from all the major sources. LinkedIn is a great place to meet influencers that can help you grow your traffic, I didn't leave that out. But I have had some really good traffic from stumbleupon, that was why I added it. It all depends on the one that works for you at the end. Just be active with the mind set of helping people. Connect with influencers, send messages to clients and ask for feedbacks. Thanks for sharing this! Great advice for new bloggers. If I may, I would also would add LinkedIn to this list. I did, its under Bonus tip. Can't leave out LinkedIn, it's just too important. Yes that's true, the statistics are all in the article above. Facebook as at august recorded 2.05 billion registered active users and 1.32 active daily users. It's really impressive. True that. Thanks for your input Jasim.